What do KPCB partner Ray Lane, ex-VP Al Gore, General Colin Powell, and movie idol Leonard DiCaprio have in common? After a number of delays in production, the first production model Fisker Karma EV was delivered to Kleiner Perkins Partner Ray Lane at KPCB HQ In Menlo Park this afternoon. Lane serves as Non-Executive Chairman of the Board of Directors of Fisker Automotive, as well as of Hewlett-Packard. Lane briefed the assembled press corps. Both he and the vehicle had that new car smell. 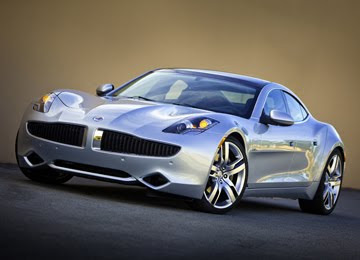 The Fisker Karma is an extended-range luxury electric vehicle that seats four. The car is powered by twin 201-horsepower electric motors and can provide a range of 300 miles and a top speed of 125 miles per hour, although you might not get both of those things at the same time. The car is a series hybrid, in that sense, similar to the Chevy Volt made by GM (NYSE:GM). It has a lithium-ion battery pack (with battery cells from A123 Systems) that powers the car. The Karma also comes with a gas generator to recharge the batteries when they get down to a 20 percent state-of-charge. The gas engine helps give the Fisker and Volt a longer range than pure electrics like the Tesla (NASDAQ:TSLA) Roadster or Nissan Leaf. The vehicle is designed by Henrik Fisker, the hand behind the sleek Aston Martin DB9 and BMW Z8. With pioneering EV maker Tesla at a $2.7 billion market cap and a strong market reception for the Nissan Leaf and Chevy Volt, other EV aspirants and investors are eyeing electric vehicles as a growth market. Earlier this year, Fisker raised $150 million in new VC funding. Here's a link to the most current SEC Form D Filing. Investors in Fisker include new investor New Enterprise Associates and existing investors like Kleiner Perkins Caufield & Byers, A123 Systems Inc., Ace Investments, Palo Alto Investors, Qatar Investment Authority, Advanced Equities, and Quantum Fuel Systems. The startup has raised more than $500 million in venture capital. Last January, Fisker raised $115 million to secure a $537 million loan from the DOE. VentureWire reports that the February round was done at a $600 million pre-money valuation. Both the Karma and Chevy Volt qualify for a $7,500 federal tax credit. I spoke with KP partner Trae Vassallo, who helped source the deal from a meeting at an industry EV panel. She emphasized that the Fisker Karma was meant to be a "no-compromise" vehicle with the unique drivetrain being transparent to the driver. The cars will be sold through a network of 45 existing luxury car dealerships. Cars are being built in Finland to start and production will eventually move to factory in Delaware. Schedule your test drive now.